Have a good meal the night before event day that is high in carbohydrates and low in fibre. Choose food that you've eaten before a long run in the past. Now is not the time to be trying out new recipes! Get your kit ready the day before to avoid rushing around on the morning of the event and pack clothes appropriate for the potential weather conditions. Run in comfortable kit that you have worn during training. This includes everything from your running shoes and socks to your underwear and top. New kit may cause chafing, blisters or general discomfort. No matter how nervous you feel before an event, don't run on empty. Toast and jam, cereal with milk or even a banana smoothie will fuel your efforts. Eat at least two hours before your event, to allow time for digestion. While you don't want to get cold and wet on the start line, avoid the temptation to overdress. Given that most events are in the morning, it's likely that the temperature will rise as the day progresses. Wear a bin liner over your running garb to keep rain off or a top layer that you can peel off and throw away once you warm up (perhaps buy some old gear from a charity shop). Toilet queues are an occupational hazard for runners, so allow plenty of time for your pre-run visit to the loo. But once you've been, try to resist the urge to go again - it's most likely nerves (especially if you don't customarily need to go three times an hour!) The chances are you'll forget all about the urge once you've started running. Try to have as many friends and family out there as possible on the day. Be very specific about where you want them to go - even down to which side of the road you'll be looking out for them on - and tell them roughly what time you expect to reach that point of the course. Remember to get your name printed on the front of your t-shirt or vest - hearing your name called, even by a total stranger, is hugely motivating. All Great Run events feature your name on your timing chip which you attach to your top – you are more than just a number. You've probably heard the advice about never doing anything on race day that you haven't tried in training. (That's why you aren't going to set off on race day in a brand spanking new pair of trainers.... promise!) But the rule also applies to food and drink. If you've never eaten mini mars bars, orange segments or bananas on the run, then politely decline them from well-meaning spectators - you just don't know how your body might react. As you get tired, you may find that your head drops and you're looking at your feet. This not only tips your torso forward, making your running technique less efficient, it can also sap your spirit, because you aren't making eye contact with fellow runners or spectators. Keeping your head up gives you a much more confidence stance and sends a positive message to your subconscious mind. Once you are on the final few miles, pick out a runner and try to catch them up. Even if you don't manage it, it gives you something to focus on. As you approach a drinks station, make eye contact with someone holding a drink out, so that they know you are going to take it from them. This saves you missing out or ending up with a drink down your t-shirt. If you are taking part in a big, busy event, it's polite (not to mention sensible) to avoid veering across the road to get a drink or coming to a sudden halt when you've got one. The biggest mistake runners of all abilities and levels of experience make is to start events too fast. It's so easily done - you're feeling great after a few days' rest, and the combination of pre-eventnerves and a carnival atmosphere conspire to make you completely forget your planned pace. It's far better to start off slower and speed up later than to find yourself being overtaken left right and centre in the second half of the event because you went off too fast. Whether you are hell bent on achieving a new personal best time or simply making it to the finish line in one piece, try to enjoy the journey as well as the destination. You've put so much into preparing for this big day, so savour it and be proud of yourself. When you cross the finish line (and you will! ), don't stop suddenly. Keep moving while your heart rate and breathing rate get back to normal. And remember to stretch out your muscles (unless they are very sore and tender, in which case it's best to leave stretching for another day). Eat and drink something within the first half hour of finishing and change into some warm dry clothes and footwear. Take a break & Give yourself credit! Be sure to rest - you've earned a break! 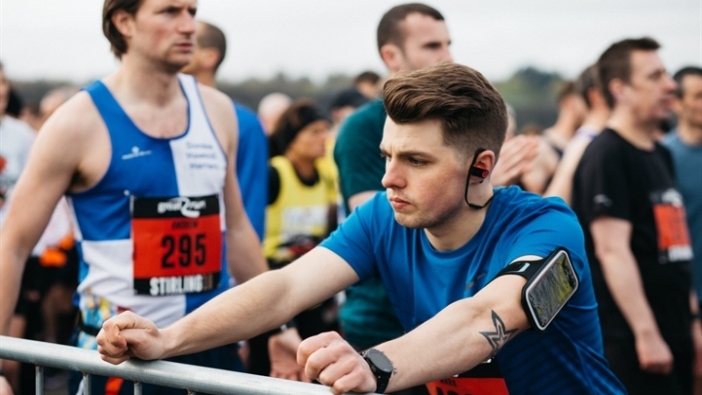 Maybe take a week off your running and make a conscious effort to congratulate or reward yourself after the event - training for and completing an event is a fantastic achievement.